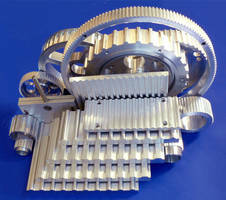 Timing Belt has 15 mm pitch design. ATS 15 timing belts are designed for power transmission and linear drive applications that require high tensile strength and flexibility. They are available in 25, 32, 50, 75, 100, and 150 mm belt widths and come in open-ended 50 or 100 m rolls, welded or in truly endless technology. Tension members are available in steel and stainless steel. "Strong and Flexible" New - 15 mm Pitch Timing Belt "ATS 15"
BRECOflex CO., L.L.C., is proud to introduce the new timing belt design ATS 15, bridging the gap (regarding the tooth pitch) between AT10 and AT20 timing belt pitches. 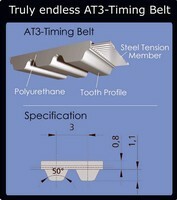 The ATS 15 offers an approximately 20% higher tensile strength compared to a AT20 belt based on the special tension member design and provides increased tooth shear strength in comparison with the AT10 belt design. The new ATS 15 is the ideal selection for power transmission and linear drive applications that require high tensile strength and high belt flexibility including a reduced polygon effect. ATS 15 timing belts are available in 25 / 32 / 50 / 75 / 100 and 150 mm belt width and come in open-ended (M) 50 m or 100 m rolls, welded (V) or in truly endless (BFX) technology. The tension members are available in steel or stainless steel. 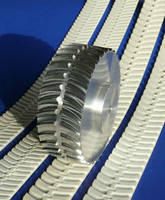 Timing Belts have tensile strength ranging from 190-1,400 N.
Endless Belts feature convertible profile technology.